Here it is! 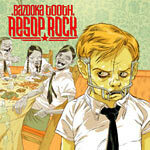 Aesop Rock's next move at putting out that music that gets you thinking. Abstract hip hop, words and beats that will make you think about where Aesop is coming from and just what exactly does he mean? This is the type of stuff thats not for the average rap music fan, but rather those who analyze and break into pieces the information presented in front of them. If this sounds like you, then this album is for you! 1-6, 8, 11, 12, 14, 15 and all interludes produced by Aesop Rock. 7, 10, 13 produced by Blockhead. 9 produced by El-P. Scratches on 1, 2, 3, 6 by DJ Cip One. Scratches on 4 by DJ paWL.